Lip & Eye Contour lifting, moisturizing, radiance Serum with Low Molecular Weight & Nano-diffused Hyaluronic Acid, Collagen, Lycopene and Anti-Wrinkle Lifting Peptides. NEW NATURAL FORMULA. 30 ml Airless Bottle in elegant case. 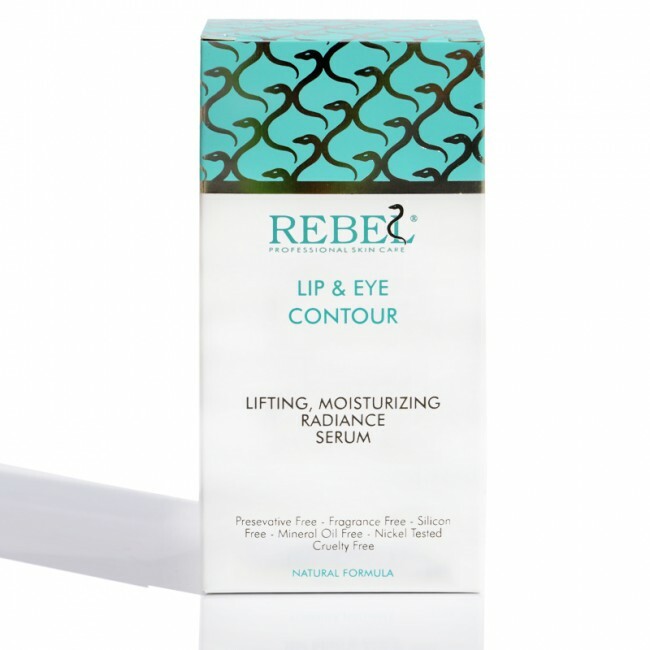 LIP & EYE CONTOUR LIFTING, MOISTURIZING, RADIANCE SERUM with Low Molecular Weight & Nano-diffused Hyaluronic Acid, Collagen, Lycopene and Anti-Wrinkle Lifting Peptides NEW NATURAL FORMUL. 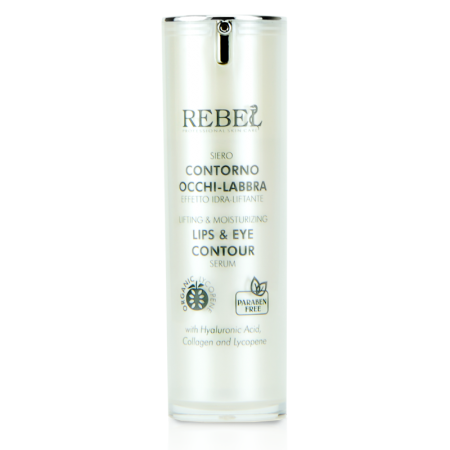 Rebel Serum Eye-Lip Contour is suitable for every skin type, including the most sensitive areas of the face, specific for eyebags, dark circles, swelling, wrinkles, dry skin and sensitive lip contour, sapless, wrinkly and prone to crack. 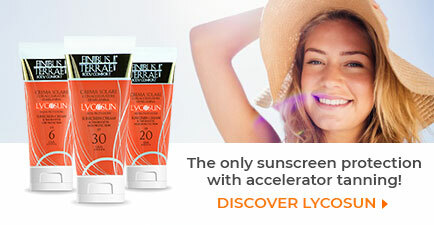 It carries a deep hydro-restitutive action. 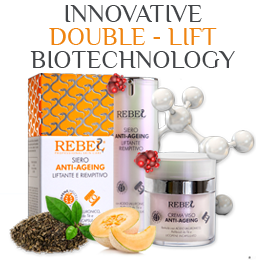 It sensibly reduces the dark circles around the eyes and relaxes thin wrinkles. The eye area shines with new light. The lip contour, well shaped, smooth and hydrated, looks younger and richer. 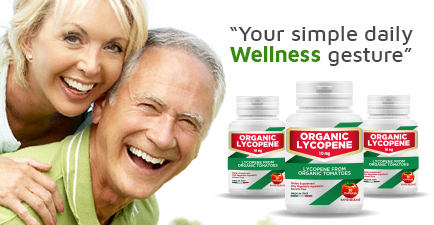 New strengthened formula, but light at the same time and quickly absorbed. Thanks to its small size, Low Molecular Weight & Nano-diffused Hyaluronic Acid deeply penetrates the skin, hydrating and filling the wrinkles from within. Tensor Peptides relax the facial skin, with natural and long lasting soothing effect, without reducing the facial expressivity. “Radiance” Effect: Mullein extract is a phytocomplex able to protect the skin from the damages caused by UV radiations, turning them in a source of light: the skin becomes bright and radiant. The dark areas of the eye contour shine in their own light. Apply Rebel Serum Eye-Lip Contour at morning and night through light touches and taps. Rebel guarantees effectiveness and goodness from the first to the very last application: thanks to the exclusive Air Less Serum erogation system, it keeps your serum safe from recurrent contact with air. Rotate the capsule to allow the spout to come out. Place it horizontally, press the dispenser repeatedly until the product comes out. Rotate to close it. Avoid the application near and/or on excoriations, wounds, sensitized areas and external mucosa. External use only. Keep away from the reach of children. In case of accidental ingestion, contact your doctor. Store in a cool and dry place, away from heat and direct sunlight. The Manufacturer/Distributor declines any responsibilities for uses outside of what is outlined in the recommendations. Aqua, Glycerin, Polyglyceryl-3 cetyl ether olivate / Succinate, Prunus amygdalus dulcis oil, Olea europaea fruit oil, Aloe barbadensis leaf juice, Caprylic / capric triglyceride, Cetearyl alcohol, Allantoin, Sodium PCA, Sodium lactate, Dipeptide diaminobutyroyl benzylamide diacetate, Verbascum thapsus extract, Sodium hyaluronate, Lycopene, Triticum vulgare seed extract, Xanthan gum, Caprylyl glycol, Phenethyl alcohol.